Jefferson Regional Foundation is bound by its mission to serve the community of Jefferson Hospital—in the South Hills and lower Mon Valley area south of Pittsburgh, PA. This is reflected in our grant eligibility as well as all aspects of our efforts. The list of communities, ZIP codes and map below reflect the current understanding of the Jefferson service area. The Jefferson service area may evolve over time and this will be reflected in the information below. 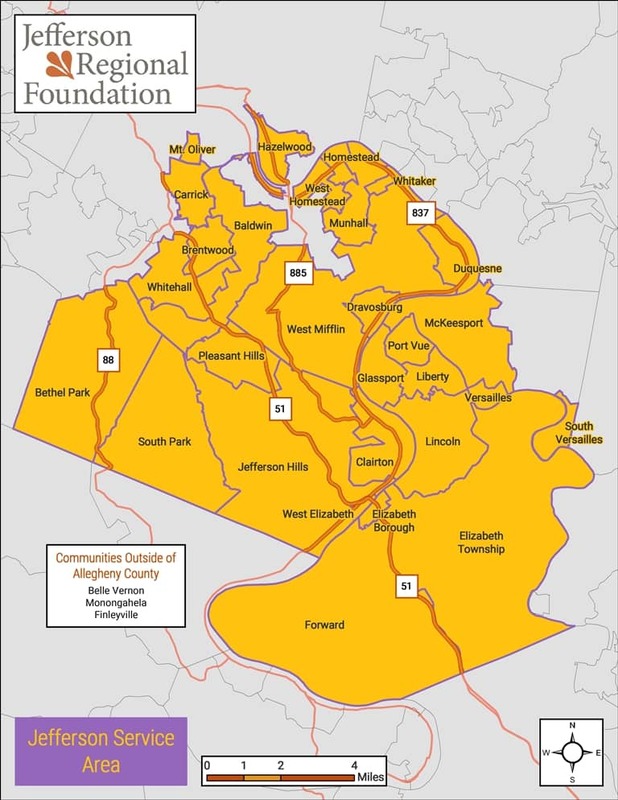 The Jefferson area encompasses the South Hills and lower Mon Valley in Allegheny County as well as adjacent communities in Washington, Fayette and Westmoreland counties. Among the communities served are: Baldwin, Belle Vernon, Bethel Park, Brentwood, Carrick, Clairton, Dravosburg, Duquesne, Elizabeth Borough, Elizabeth Township, Finleyville, Forward, Glassport, Hazelwood, Homestead, Jefferson Hills, Liberty, Lincoln, McKeesport, Monongahela, Mt. Oliver, Munhall, Pleasant Hills, Port Vue, South Park, South Versailles, Versailles, West Elizabeth, West Homestead, West Mifflin, Whitaker, and Whitehall.